As best we can tell, Kristine Hall of Valencia, California, is the first Deaf person to go onstage as a contestant in CBS’s long-running game show, The Price is Right. This episode aired on October 19. Clips with captioning were helpfully posted on YouTube. Many of us enjoy watching game shows for the vicarious thrill: “If only it was me up there—I’d love to win one of those neat prizes!” Hall got an unexpected thrill when she was called up to enter the competition. Hall is a Gallaudet University alumna who teaches Deaf adults at North Valley Occupational Center in Mission Hills, and also teaches ASL at CSUN and College of the Canyons. She loves her work and her students—“I’m ‘mother’ to them.” Her husband Richard teaches Film Production at Marlton School in Los Angeles. They have two young daughters, Kalissa and Maxella. Contrary to popular belief, contestants on PIR are not chosen at random. They’re informally interviewed and screened before the show. Everyone in the audience has their identification verified, and fills out a questionnaire. Potential contestants are asked to sit in a particular section of seats. Hall had two interpreters. One arrived early and was good and skillful; the other arrived late, and was inexperienced and low-energy. She preferred to have the more skillful interpreter stay with her students, which left her with the less skillful one. She signs lightning ASL; he did PSE, slowly. When she was onstage, he stood blocking her from the audience’s view, also blocked her view of Carey, and refused to move when she asked him to. She coped gracefully with this extremely trying situation. After Carey came onstage, Hall got a “Lucky Spot” call-up to join three competitors on Contestants’ Row for the One Bid segment: making the bid closest to the retail price on a pair of Dahon mountain bicycles. She made the winning bid: $800. She was then summoned onstage for the Grocery Game, which required her to guess the total cost of five ingredients needed to make a no-bake peanut-butter pie. She could “purchase” some or all of the five items and as many multiples as she liked, but the total had to be between $20 and $21. She ended up with a total of $20.98, winning a mahogany-finish bedroom set and mattress set. 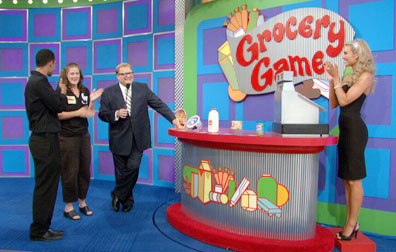 Her third challenge, the Showcase Showdown, involved spinning the Big Wheel to reach a total of $1 without going over. She spun 5, then 95, tying with another contestant. To break the tie, she had to spin more than 35. She spun 30. “Off by a nickel.” Having been put out of the competition, she returned to her seat, feeling disappointed and frustrated, but after the show Carey came over, comforted her, chatted with her students, and learned that he and the show have some passionate Deaf fans in Mission Hills! Winners usually receive their prizes after their episodes have aired. Hall has the bicycles, mattress, and a thousand-dollar prize; she’s expecting the bedroom set to arrive in March. Once it’s delivered, she’ll have a party and will make peanut-butter pie, but with chocolate added “because I’m addicted to CHOCOLATE!” Then comes the fun part: opening the cartons.